What your business is today is not what it will be in the future. Small companies want to get big – big companies want to get bigger. One thing they all have in common is the need for logistics operations that can enable growth – and this takes foresight. It also includes anticipating the capabilities and support you’ll need from logistics partners. This means your network of carriers, warehouses, and other transportation resources need to keep up with you – or better yet, stay one step ahead. 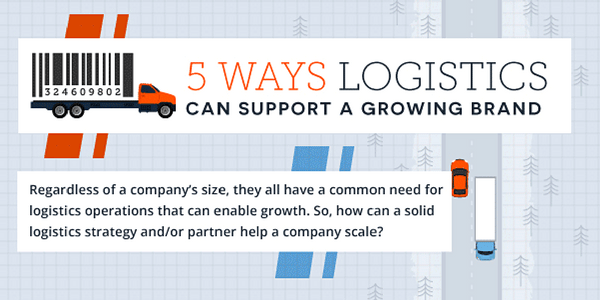 So, how can a solid logistics strategy or partner help a company grow and why is it important to stay nimble? For most companies, growth comes about through entering new markets or expanding geographically. Transportation is a business of distance, meaning as shipping distances increase so do costs. This makes the proximity of you to your customers a major factor in your logistics costs and the service levels you provide. As a result, the locations of your manufacturing facilities, co-packing partners, and warehouses all impact logistics costs and service. Forward-looking companies see the value in finding partners who can scale as they do both in terms of resources and capacity, as well as geography. As a new brand expands, it is beneficial to engage a logistics service provider to weigh in on decisions that involve location. A knowledgeable 3PL can help brands remain strategic and make choices that positively impact costs and network expansion down the road. As the size of your customers change it will also impact their expectations of you. Selling to big-box retailers like Walmart and Costco, or Amazon is a wake-up call for some companies. These types of customers have (and use) more leverage to pressure suppliers with their delivery requirements. All are quick to issue chargebacks and make tougher demands on service levels. Working with logistics partners who know how these retailers work is a big advantage for companies moving “up-market” in this way. An experienced 3PL will know each retailer’s preferred carrier partners, schedules, load preferences, and other nuances. A good base of understanding goes a long way in preventing expensive chargebacks, refused loads, detention, and other accessorial or service charges. At Zipline, over 80% of our customer orders ship into major retail locations. Our logistics consultants are experts in handling strict retail requirements and help shippers manage complexities daily. New product innovation and launch are critical for fast growing CPG brands. As your number of SKUs expands, so will the complexities of shipping and handling. A new product may require a temperature controlled warehouse or trailer when your previous SKU did not. Or there may be a significant change in shipment density or fragility, which will impact freight classification, and as a result, shipping costs. Experienced carrier partners who have the flexibility to handle different, but related products are an underappreciated advantage to your business. A scalable 3PL will have a robust network to service all your potential SKU requirements, not just the ones you need right now. As you grow to have larger product volumes, the right logistics partner should help you uncover lower transportation costs. Higher volumes mean more leverage for lower freight rates, the potential for lower-cost mode selection – LTL to FTL or rail – as well as opportunities for order consolidation. Logistics partners who are in tune with the growth of your business and are looking out for your best interests should uncover these savings opportunities for you. The complexity of managing logistics will grow as you do. More distribution points and consignees make efficient load and production planning more complicated. Ensuring the right mode is used and carriers are selected gets exponentially harder. The old ways of doing business won’t work and leveraging technology is the only way to ensure these important decisions are made objectively. Most logistics providers will offer performance reports and software solutions to help manage many of the manual and data-intensive parts of your logistics operation. The best partners will also provide analysis and meaningful insights for your business. This level of business intelligence can pinpoint trends and opportunities within data for improved performance and cost savings. As CPG companies navigate growth and expansion, having a dedicated logistics partner on the team can make all the difference. A knowledgeable 3PL can help companies see what impacts new customers, locations, or products will have on transportation costs, and provide counsel for both immediate and future outcomes. Planning logistics resources for the present and future enables companies to use logistics as a competitive advantage. Without, the supply chain can become a major barrier to a company’s growth. Read how Zipline Logistics helped Hoist Water navigate its nation-wide expansion to more than 5,000 retail buyers.